Cooking and Roasting Times and Preparation and cooking of meat - NeedARecipe.com offers advice and information on buying and preparing food. The cooking and roasting times on this page are approximate and are intended as a suggested cooking technique. They are indicative of roasting in an open baking tray: recipes that require the meat to be covered may vary and will be specified in the recipe. If you are new to roasting meat, a meat thermometer is useful to ensure that the meat has been cooked as desired. This is particularly important for larger roasts (over 3Kg) for which cooking times can vary considerably depending on their shape. It is always well worth buying the best quality meat you can afford, particularly if the roast is for a special occasion. A good local butcher or farmers market will be able to provide you with meat of good provenance that has been properly hung (where appropriate) and prepared. Alternatively there are now a number of companies selling excellent-quality meat online. 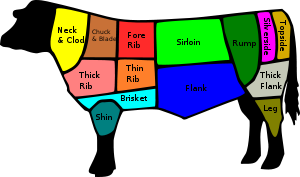 The proper beef cooking times and the correct beef cooking temperatures are extremely important. The optimum flavour and tenderness of various cuts of beef can be consistently achieved when care is taken to follow the recommended time and temperature guidelines for cooking beef. Using the recommended time and temperature guidelines will ensure that the meat is cooked to the minimum safe internal temperature, which is critical in avoiding food-borne illness that can be caused by undercooked food. Using an accurate meat thermometer is highly recommended. Whether you are looking for an eye round roast cooking time or a beef tenderloin cooking time, use the following chart as a guide for any roast beef cooking time and cooking temperature. 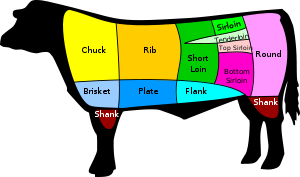 The chart can be used for beef cuts that are oven roasted, pan fried, pan broiled, oven broiled, grilled, or are inserted into an oven bag prior to roasting. 180ºC 4-6 lbs 18-22 min. 22-26 min. 28-34 min. 34-36 min. 36-38 min. 6-8 lbs 15-18 min. 18-22 min. 22-28 min. 28-30 min. 30-32 min. 180ºC 4-6 lbs 18-20 min. 20-22 min. 20-24 min. 22-24 min. 22-26 min. 165ºC 2 - 3 lbs 35-38 min. 35-45 min. 45-53 min. 45-60 min. 55-68 min. 165ºC 3-4 lbs 28-30 min. 30-35 min. 38-45 min. 45-48 min. 48-50 min. 6-8 lbs 16-18 min. 18-20 min. 23-25 min. 25-28 min. 28-30 min. 150-165ºC 3½-4 lbs 35 min. 36 min. 38 min. 39 min. 40 min. 150-165ºC 5-7 lbs 32 min. 35 min. 38 min. 43 min. 48 min. 150-165ºC 4-6 lbs 25 min. 26 min. 28 min. 29 min. 30 min. 5ºC (10ºF) below the desired doneness. The temperature will continue to rise as the meat stands. Cube steak ½" 6-8 min. Steak 1" 8-11 min. 11-12 min. 12-14 min. 14-15 min. 15-17 min. Cube steak ½" 5-8 min. 1½" 25 min. 30 min. 2" 35 min. 45 min. Porterhouse steak 1" 20 min. 25 min. 1½" 30 min. 35 min. 2" 40 min. 45 min. Chuck blade steak ¾" 14 min. 20 min. 1" 20 min. 25 min. 1½" 35 min. 40 min. Tenderloin steak 1" 10 min. 15 min. 1½" 15 min. 20 min. Sirloin steak 1" 20 min. 25 min. Top loin steak 1" 15 min. 20 min. Top round 1" 20 min. 30 min. Flank steak 1 - 1½ lbs 12 min. 14 min. Hamburger patty* 1" 8 min. 12 min. Steak 1" 5 min. 6 min. 8 min. Steak 2" 16 min. 18 min. 20 min. Rib eye ¾" 5-7 min. 6-8 min. 7-9 min. 8 - 10 min. 9-11 min. New York strip 1" 8 - 10 min. 9-11 min. 10-12 min. 11-13 min. 12-14 min. Flank steak 1 - 1½ lbs 10-15 min. 14-18 min. 15-19 min. 1½" 10-12 min. 11-13 min. 12-15 min. 14-18 min. 15-19 min. 2" 15-17 min. 16-18 min. 17-19 min. 18-20 min. 19-22 min. Ribs (back) cut in 1-rib portions 10 min. Tenderloin Half: 2 - 3 lbs 10-12 min. Whole: 4-6 lbs 12-15 min. Hamburger patty* 1" thick/6-oz 4 min. 5 min. 6 min. 7 min. 8 min. illnesses in small children, the elderly, and those with compromised immune systems. Note: When grilling with Indirect Heat generally the coals (or burners on a gas grill) are heated to a high heat. When grilling with Direct Heat the coals (or burners on a gas grill) are heated to a medium heat. Use these heat settings unless you have a recipe that states something different..
Oven Bag Instructions: Preheat the oven to 160ºC (325ºF). Add 1 tablespoon flour to the oven bag and distribute evenly on the inside of the bag prior to inserting the beef. Remove the meat from the oven when the meat thermometer reaches the temperature listed or when the meat is fork tender. If using a turkey-size oven bag for a beef cut smaller than 12 lbs, gather the oven bag loosely around the beef allowing room for heat circulation; then close the bag with a nylon tie, and cut away any excess oven bag. Use the following chart as a guide for whole chicken cooking times, as well as for parts of a chicken, such as the proper chicken breast cooking time. Cooking times are provided for oven-baked or roasted chicken, stewed chicken, grilled chicken, or chicken that is inserted into an oven bag prior to cooking. meat thermometer reads 175º- 345ºF; the temperature will continue to rise as the chicken stands. Oven Bag Instructions: Preheat the oven to 350ºF. Add 1 tablespoon flour to the oven bag and distribute evenly on the inside of the bag prior to inserting the chicken. Brush the chicken with vegetable oil or butter. Remove the chicken from the oven when the meat thermometer reaches 180ºF. If it is necessary to use a turkey-size oven bag for a chicken, gather the oven bag loosely around the meat allowing room for heat circulation; then close the bag with a nylon tie, and cut away any excess oven bag. Whether you are looking for a boneless leg of lamb cooking time or a rack of lamb cooking time, use the following chart as a cooking time and temperature guide for lamb cuts that are cooked in the oven, grilled, or are inserted into an oven bag prior to cooking. Oven Bag Instructions: Preheat the oven to 325ºF. Add 1 tablespoon flour to the oven bag and distribute evenly on the inside of the bag prior to inserting the lamb. Remove the lamb from the oven when the meat thermometer reaches 150ºF or when the meat is fork tender. If using a turkey-size oven bag for a lamb cut smaller than 12 lbs, gather the oven bag loosely around the lamb meat allowing room for heat circulation; then close the bag with a nylon tie, and cut away any excess oven bag. Remove the joint from the oven and rest for 15-20 mins before carving. To tell if the lamb is cooked to your liking, insert a skewer into the centre, remove it, then press the flat of the skewer against the meat: as the juice runs out, you will see to what degree the meat is cooked – the pinker the juice, the rarer the meat. Whether you are looking for a pork loin cooking time or a pork chop cooking time, use the following chart as a cooking time and temperature guide for pork cuts (including ham) that are cooked in the oven, grilled, or are inserted into an oven bag prior to cooking. (cook before eating) Cook to 63ºC (145ºF) 3 - 4 lbs 10 - 12 min. per lb. 5 - 7 lbs 12 - 18 min. per lb. 10 - 14 lbs 30 - 35 min. per lb. Note: When grilling with Indirect Heat generally the coals (or burners on a gas grill) are heated to a high heat. When grilling with Direct Heat the coals (or burners on a gas grill) are heated to a medium heat. Use these heat settings unless you have a recipe that states something different. can be reduced for fresh or not fully cooked pork at 145ºF. For these two, soak covered in water for 24 hrs before cooking. Drain, then add 4 cups of fresh water to the bag to cook. Oven Bag Instructions: Preheat the oven to 325ºF. Add 1 tablespoon flour to the oven bag and distribute evenly on the inside of the bag prior to inserting the cut of pork. Remove the meat from the oven when the meat thermometer reaches the temperature listed or when the meat is fork tender (see the note at the top of the Oven Bag Cooking Chart in regard to cooking times). If using a turkey-size oven bag for a pork cut smaller than 12 lbs, gather the oven bag loosely around the meat allowing room for heat circulation; then close the bag with a nylon tie, and cut away any excess oven bag. Use the following chart as a turkey cooking time and temperature guide for whole turkeys and turkey parts that are oven baked or roasted, grilled, or are inserted into an oven bag prior to cooking the turkey. below the desired doneness. The temperature will continue to rise as the turkey stands. Oven Bag Instructions: Preheat the oven to 350ºF. Add 1 tablespoon flour to the oven bag and distribute evenly on the inside of the bag prior to inserting the turkey. Brush the turkey with vegetable oil or butter. Remove the turkey from the oven when the meat thermometer reaches 175º- 180ºF. If using a turkey-size oven bag for a turkey smaller than 12 lbs, gather the oven bag loosely around the meat allowing room for heat circulation; then close the bag with a nylon tie, and cut away any excess oven bag. Using the recommended time and temperature guidelines will ensure that the meat is cooked to the minimum safe internal temperature, which is critical in preventing food-borne illness that can be caused by undercooked meat. Using an accurate meat thermometer is the best way to ensure proper doneness when cooking veal. Use the following chart as a guide for determining the correct cooking time and temperature depending on the type of veal cut that you plan to use, the weight or thickness of the meat, and whether the veal will be grilled or oven roasted. below the desired doneness. The temperature will continue to rise as the meat stands. What should I make him for Father's Day? Why not spoil him with one of our specially chosen Father's Day recipes? Go ahead - make his day! Not everybody is a carnivore. If you prefer vegetables, here's a selection that will give you a choice of some really stunning dishes.